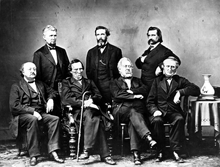 The impeachment managers for the impeachment of U.S. President Andrew Johnson, 1868. View a larger image. Standing are James Falconer Wilson (R-Iowa 1st), George Sewall Boutwell (R-Massachusetts 7th), and John Alexander Logan (R-Illinois at-large). 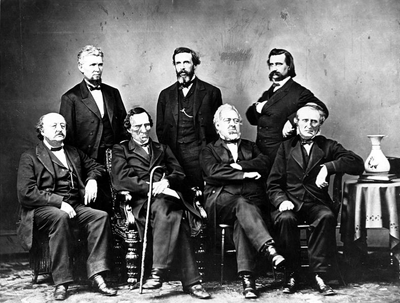 Seated are Benjamin Franklin Butler (R-Massachusetts 5th at the time), Thaddeus Stevens (R-Pennsylvania 9th), Thomas Williams (R-Pennsylvania 23rd), and John Armor Bingham (R-Ohio 16th). Thaddeus Stevens, a Radical Republican, is the character to whom President Lincoln tells the "True North" story in the recent film, Lincoln. Lincoln wanted to persuade Stevens to argue more moderately in favor of the 13th Amendment, because he felt that a more ideological argument would result in failure. Paraphrasing Lincoln's line in the film, "A compass will point you true North. But it won't show you the swamps in between you and there. If you don't avoid the swamps, what's the use of knowing true North?" Essentially, Lincoln is arguing for a pragmatic approach in preference to a more ideological one. The line is likely invented by the filmmakers. I know of no evidence that Lincoln actually employed such a metaphor. Nevertheless, it is a powerful illustration of the interplay between the objective orientation and the obstacle orientation. Success demands both. Photo by Mathew Brady, in the United States Signal Corps, War Department, Washington, 1868. Available from Wikipedia. People have preferences. We have preferences about so many different things that the number of different combinations is enormous. Everyone is unique. We even have preferences about the ways we try to solve problems. One classification of problem-solving preferences is the relative interest we have in focusing on objectives versus obstacles. To focus on objectives is to keep foremost in mind what we're trying to achieve by solving the problem. To focus on obstacles is to look first at the difficulties we face when we try to implement candidate solutions. When we approach problem solving, few of us are aware of whether we prefer to focus on objectives or obstacles. And few of us make conscious choices of focus during the solution process. Because solving problems successfully requires balanced attention to both objectives and obstacles, choosing the right focus at the right stage of problem solving can dramatically enhance problem solving effectiveness. Here are some observations that can help you make wise choices. A focus on objectives helps us find the way to the goal when we must make the detours needed to evade or eliminate obstacles. Keeping objectives in mind can be inspiring when attaining them seems out of reach, or when we encounter obstacles wherever we turn. The objective orientation has a dark side, too. It can lead to an obsession with ideas that seem promising, but which have little practical value. And it can lead us to reject out of hand any candidate solution that requires that we temporarily deviate from the direct path to our goal. Rigid adherence to the objective orientation can actually prevent us from finding ways around obstacles. path to failureearly in the search for solutions. This enables wise allocation of resources, which helps us rank possible solutions according to likelihood of success. And when we notice a common theme among some of the obstacles we find early in the search, we can apply that insight to the task of generating more promising candidate solutions. The obstacle orientation has a dark side, too. A focus on obstacles can be dispiriting, because we must search for reasons why candidate solutions don't work. Sometimes we must consider the question, "Can any solution at all ever work?" And sometimes we can become so lost in addressing obstacles that we lose sight of the objective. Would you like to see your comments posted here? rbrenZnUIlcaVjVjfFcGoner@ChacrcBZpPeKWYxnaaHZoCanyon.comSend me your comments by email, or by Web form. See also Problem Solving and Creativity and Personal, Team, and Organizational Effectiveness for more related articles. I offer email and telephone coaching at both corporate and individual rates. Contact Rick for details at rbrenwOScUxeoPfsiQDKOner@ChaccDyPeTeCRSCPFavhoCanyon.com or (650) 787-6475, or toll-free in the continental US at (866) 378-5470.